The Do It Yourself movement is enjoying a resurgence amongst the environmentally conscious. As a result, the range of eco-friendly and ethical arts and craft materials available to the conscientious shopper is rapidly expanding. While some are returning to the traditional wool, jute and linen, other companies are creating entirely new non-animal, non-oil based renewable textiles from plant matter like bamboo and soy. The most inventive are finding ways to reclaim otherwise disposable materials like plastic bags and tires to create new inspired works. Mass produced textiles and yarns typically use chemicals, oil and energy to a degree that is not ecologically sustainable as many are neither recyclable nor biodegradable and end up in incinerators or landfill sites. The production of oil-based synthetic fabrics like nylon and polyester require the mining, refining, and processing of oil. In addition, they use a myriad of toxic additives and colors, as well as massive amounts of energy and water. Hazardous chemicals commonly used in the textile industry are lead, arylamines, phthalates, nickel, chromium IV and formaldehyde –- all of which can negatively affect people, nature and biodiversity. In addition, textiles and apparel made in sweatshops are linked to multiple human rights violations, including child labor, sub-minimum wages, no benefits, forced overtime, and unsafe working conditions. Traditional crafting materials like wool, jute (coconut fiber), silk, linen and cotton are popular for their versatility and hard wearing qualities. However, those that are animal based (wool and silk) raise ethical questions. Animals raised for wool production suffer many of the same indignities as those raised for meat — they are selectively bred to have unnatural and often distressing physical characteristics such as very thick wool, which can make their lives unpleasant. Sheep can suffer wool blindness or heat exhaustion because of excessive wool growth. Sheep are often ‘mulesed‘, a cruel process involving slicing a large piece of flesh from the behinds of animals without using anesthesia to prevent flystrike. Animals are also ear tagged, have electric prods used on them and are eventually sold to slaughterhouses when their wool production declines. Silk on the other hand is produced from the cocoons of the metamorphosing silk worm. In order to remove the silk from the cocoons, the worms are steamed to death, never achieving their life-cycle potential. Cotton is also environmentally suspect, as the biggest consumer worldwide of pesticides, insecticides and water. Contamination of the natural environment and the attendant effects on human and animal health are common in cotton growing regions. For example, the Aral Sea in Central Asia has shrunk to just 15% of its former volume, largely due to the vast quantity of water required for cotton production and dying. Radical new fibers are being developed to compete with the natural qualities of traditional ones that can satisfy environmental and ethical considerations. Bamboo, soy, banana, corn and other cellulose based fabrics and yarns are now available. While all are animal-free, the processing of these textiles still involves the need for volatile and toxic chemicals. Soy yarn comes from leftovers of tofu production and can be made in the same manner as hemp and flax processing. However, it’s important to know that crop remnants used to make the soy and corn yarn tend to be genetically modified, and those that are GM-free (a very small percentage) are very expensive since they are not mass-produced. Genetically modified organisms can potentially have a negative impact on the environment, humans as well as other organisms. For example, the Monarch Butterfly population is declining due to genetically modified corn pollen dusted on milkweed plants (their food) on corn fields — the toxin in the pollen interferes with their breeding cycle killing their potential offspring. Bamboo textiles have been controversial as well because they can be processed with all the attendant pollution issues and can contain bee’s wax. However, bamboo fabric can also be made more sustainably using the same mechanical process that creates fabric from flax and hemp and hopefully these practices will prevail with time. For the consumer, the difference can only be seen in the labeling, since synthetic bamboo production must be labeled as rayon in the U.S. So what CAN we wear? It’s not all bad news! Because of processing issues, natural organic fibers still remain the most sustainable products on the market. Choosing yarns that are biodegradable, animal-free and require minimal chemical processing is key. Organic cotton — This is a great clean, green animal-free alternative. Patagonia nature cotton (minimally processed and hand-dyed by a women’s collective in Chile), Manos Del Uruguay cotton and Habu Textiles are great choices. Linen — Environmentally friendly fibers made from the flax plant. Habu Textiles makes various 100% linen papers. Hemp — Hemp yarn is one of the oldest and most versatile fabrics used in textile production and it is known for its durability and strength. 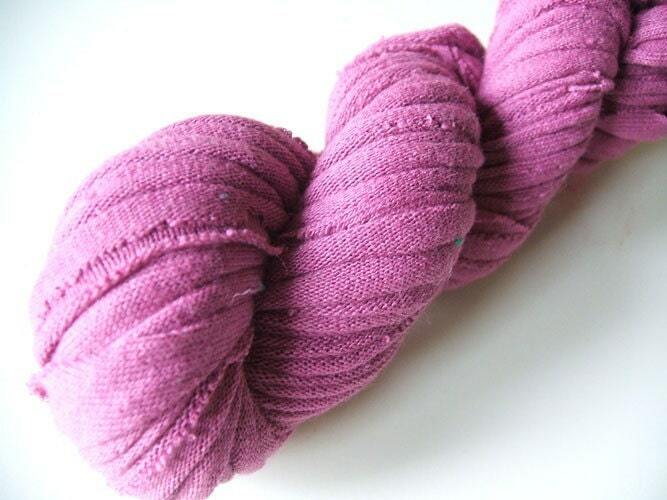 Banana Silk — Spun from the fibers of the banana or abaca plant, Banana Silk is a great alternative for knitters that don’t want to use wool, cotton, and acrylic fibers. To learn more about organic, eco-friendly and animal-free yarns, please visit Green Knitter for an extensive list. 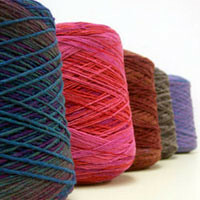 Reused yarn – Perhaps the most exciting trend in crafting is the reuse movement. For example, 2nd time around cotton is made of leftover scraps from the textile industry, and is 75% cotton and 25% acrylic. Recycling other items — If you want to try knitting with plastic bags this site has a useful guide. Knitting with recycled or reused synthetic yarns doesn’t help oil profits or cause environmental impacts. Besides, pretty much anything that looks like yarn can act like yarn so go for wires, ropes, ribbons, film reel, cassette tapes and so forth. Lastly, make sure you use vegan, eco-friendly dryer sheets and fabric softeners as well!